Your Loving Dood & Tick Tack. It's just so heartbreaking, and just so unfair. Bloat is such a horror to dog owners. Excellent! We are off to paypal. Yup, we can send emergency bird seed. Losing Our EASY is a Dark as a Salamander's A$$ Time fur Blogville. These are the situations in which BLOGVILLE Shines like a Bright Star. RIGHT? 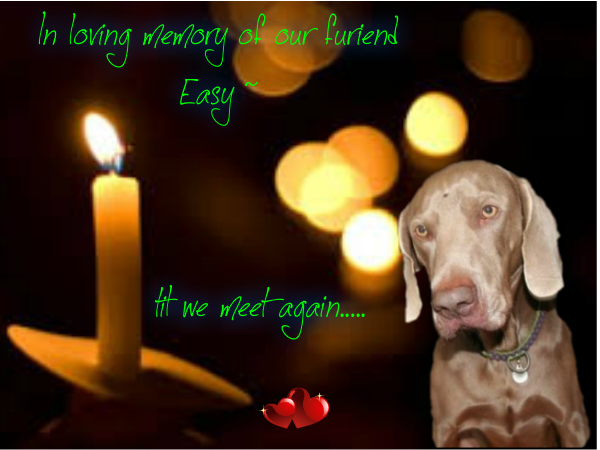 Easy will be missed furever. We are all stunned and the sudden passing of Easy. We got our mom's plastic card out and pawed some money to Easy's pawrents today. So sad... broken hearted here in Colorado.